Ample calories help you go the long haul during training. Training for a half marathon requires time, dedication and willpower – but it is all worth it, because, for these 12 to 16 weeks, you can eat anything you want. Or can you? Although you are running between three and six days per week, depending on the intensity of your training plan and your goals, you do not have license to down a pint of ice cream and a bag of chips daily. You are still susceptible to gaining weight if you consume more calories than you burn. Gaining weight not only stretches your spandex, it slows you down come race day. The exact number of calories you need depends on several individual factors, but you can follow some general calorie rules when creating a meal plan and making dietary choices. How many calories you need on a daily basis depends on your size, age, body composition, overall activity level and genetics. The larger you are, the more calories you need to maintain your weight. For example, a 125-pound woman burns 240 calories for 30 minutes running 12-minute miles, while a 155-pound woman burns about 298 calories. Older women tend to burn fewer calories than younger women, due to natural reduction of muscle mass and hormonal differences. Muscle takes more energy to maintain than fat, so having a low body fat percentage usually means you can afford more calories, too. What you do outside of your running training also influences your total calorie needs. If you sit in your office chair or opt for a spot on the couch watching reality television most hours of the day, you’ll need fewer calories than your competitor who leads an active life all day long. 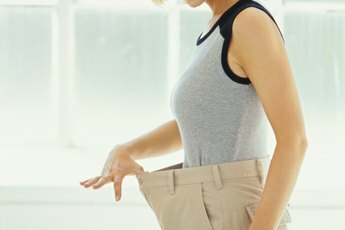 Genetics also plays a role in your calorie needs; some women’s engines simply burn through calories faster than others. You can use an online calculator to roughly determine the number of calories you burn on a daily basis, without exercise. Be honest about how active you are outside of your run training to get a more accurate estimation. For most office jobs, sedentary or lightly active are apt descriptions. Active to highly active usually implies you have a job that keeps you on your feet, moving for several hours during the day, such as a waitress or construction worker. 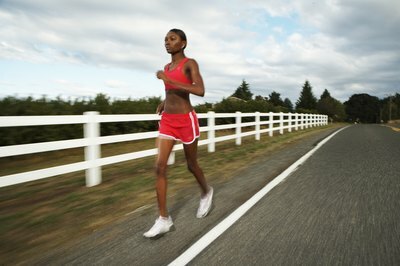 Compute your run training calorie burn and add that to your totals. For example, a 125-pound woman burns about 300 calories running for 30 minutes at a 6-mph pace. If you are running about 20 miles per week – approximately 3.5 hours -- you’ll burn an extra 2,100 calories total, or about 300 extra calories daily. You can add that 300 calories to your daily calorie burn to figure how much you can eat daily. A rough estimate for a woman aged 31 to 50 years running 20 miles per week is between 2,100 and 2,500 calories. The type of calories you eat is as important as how many. Don’t be afraid of carbohydrates, which are your best fuel source when running. Consume at least 55 percent of your daily calories from healthy sources, such as whole grains, fruits, leafy greens and beans. You may indulge in easy-digesting carbohydrates, such as white bread and sugary gels, just before a long run to provide yourself with immediate fuel, but keep these to 10 percent or fewer of total calories. The rest of your calories should consist of 15 to 20 percent lean proteins, such as skinless chicken, flank steak, tofu and low-fat dairy, and 25 to 30 percent healthy fats from nuts, avocados and seeds. 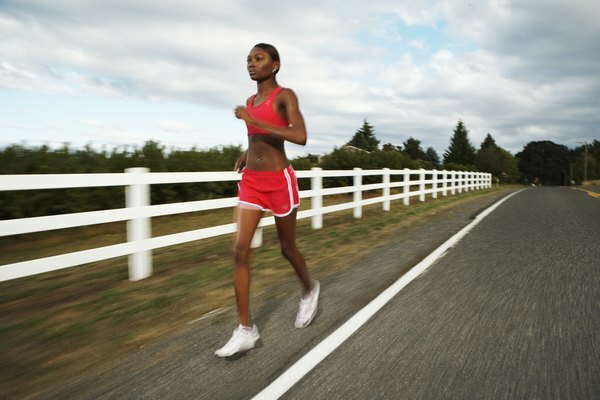 If your intention in putting in all the miles is to drop a few pounds, resolve to do so slowly. Skimping too much on calories can leave you without the energy necessary to complete your goal training runs. A 1/2- to 1-pound per week rate of loss is acceptable and doable when training for a half marathon, so you’d trim your daily intake by 250 to 500 calories below what you burn. Don’t skimp on prerun fuel or postrun recovery foods, however, which could cause you to lose muscle mass rather than unwanted fat. If your run is scheduled two hours or more after your last meal, have a slice of fruit or half an energy bar before heading out. If your run lasts less than 90 minutes, you probably don’t need to load up on energy-sustaining calories during your session; this includes gels, energy chews and sports drinks. A run lasting longer than 90 minutes warrants these mid-run snacks to sustain your hydration, electrolyte and carbohydrate levels. Eat a meal containing a ratio of carbohydrates to protein of 4 to 1 after long runs lasting longer than 45 minutes. If you aren’t scheduled for a full sit-down dinner, have a snack, such as a smoothie made with bananas and whey protein or an apple with peanut butter. What Is the USDA Total Intake for Carbohydrates Per Day?